Best time to travel to Nepal. 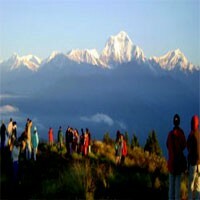 The best time to travel to Nepal is according to your holiday and proposes visiting Nepal. 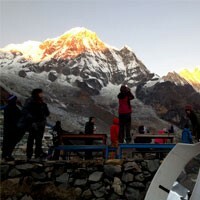 All-time in a year is good t travel in Nepal. There are four seasons during the year. Spring (March to May), summer (June to August), autumn (September to November) and winter (December to February). Summer usually will be rainy days so it is not very good for the travellers but still, there are short treks, treks to upper Mustang and upper Dolpo, water rafting and city tours can be done. Winter is cold in Kathmandu but not freezing. Some day tours, jungle safari and short treks are good to do. 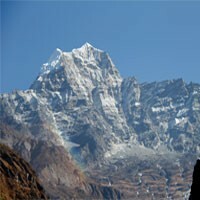 The main season for trekking is autumn and spring. Some longer trek, high passes trekking and going to the mountain base camps most of the tourists come in these seasons. During these seasons are not too cold and the view of the Himalayas is perfect. Spring is the king of the season, so colourful forest with the blooming flower is one of the best to see. Spring is the best time for climbers for expeditions and peak climb. Nepal is the land of multi-ethnic people and their culture, so almost every month, there are festivals according to Hinduism and Buddhism. Cultural and festival tours can be done all the year. Fishing tours are better during the monsoon. Sakura (Cherry blossom) bloom in the different season in Nepal. They bloom in autumn.